The wheel lift system is my invention. I worked it out so the chicken tractor is balanced with very little effort needed to lift the end to move it. The location near the center also prevents the operator from lifting it high enough on either end for a hen to escape. (if the wheels are near the end the operator could lift high enough for the birds to fly the coop! LOL!) It’s also very easy to lift or drop by even a small child. The tractor sits 3″ off the ground when raised on fat 10″ wheels and is very easy to roll around (even uphill) and on soft ground. It would be easy to make these in such a way that the assembly could be bolted on to a chicken tractor with a Lag bolt into say a 4×4 or whatever was strong enough to support the force placed on it. 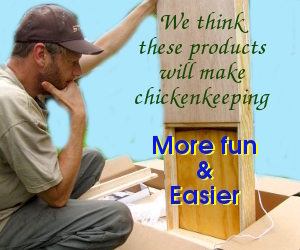 In other words they could be built and installed on various configurations of chicken tractors after market. Duncan’s stunning diagrams and photos tell the whole story much better than I could. Aren’t you chicken tractor folks itching to try it out? Mom of Two Girls and Three Cats — I wish I could help you out with details, but we’ve never actually made a wheel lift and our guest poster isn’t available for comment. I hope you’ll drop me an email with some photos if you do figure it out and make your own, though!